Perhaps an AK or an SKS isn't the first gun that comes to mind when you think "deer rifle." 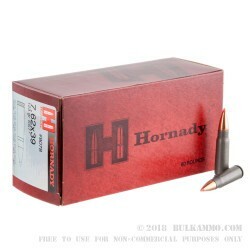 This 7.62x39mm ammo from Hornady will have you thinking again though! 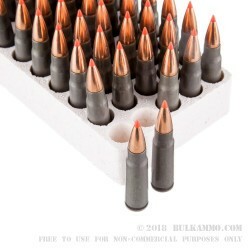 Each cartridge in this box of 50 fires a SST bullet at a muzzle velocity of 2,350 feet per second from a 20-inch test barrel, delivering great mid-range accuracy and killing power against midsize game. The Hornady SST bullet is a polymer-tipped design that provides extreme accuracy along with devastating expansion. In addition to a highly aerodynamic tip and secant ogive profile, it features an Interlock ring to keep the core and jacket tightly bound together for maximum weight retention. These cartridges use non-corrosive Berdan primers and non-reloadable steel cases coated for reliable cycling. 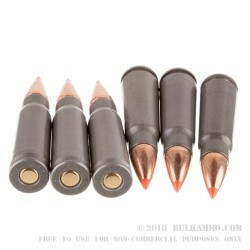 The steel used in this ammo helps keep costs down, especially in a caliber that generally isn't reloaded. Q: Is there any steel in the bullet itself? A: Hello Doug, The Hornady SST bullet does not contain any steel at all.